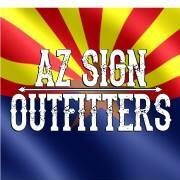 15 years in Tucson providing signs, vehicle graphics, banners and more! Do you want your business to be noticed? We can help with outstanding signs, banners, vehicle graphics and wraps, flags, canopies and more. Our customers are often surprised to find out they can go local and save money over online options. We provide graphic and layout services if you have an idea of what you want but no artist to create it for you. -Remember, thousands of people see your vehicle every day, wraps pay! Good signs are a sign of a well-run business; let us help you with yours!